The Doctor and the Master. Theirs is a friendship—and a rivalry—that has outlived civilizations. Together, they have witnessed the fall of empires, and their never-ending conflict has led to the collapse of universes. Their fates have been inextricably intertwined by the Time Lords of Gallifrey. Following the most recent of his many deaths, the Master’s consciousness was extrapolated from the Matrix and infused in an android body. He is now a permanent fixture of the Doctor’s TARDIS, unable to leave its confines and thereby forced to aid the Doctor in his mysterious missions throughout time and space. Most infamous of the renegade Time Lords, the Master possesses a genius level intellect that is both reckless and dangerous. His ingenuity is corrupted by his obsessions. Even in this artificial form, however, the Master’s presence is powerful. He possesses a formidable gift for hypnosis, the power to enthrall and convince others. Though it is unknown why the Time Lords have forced the Master to accompany his arch-nemesis on their enigmatic errands, he harbors secret knowledge destined to play a pivotal role in the cosmic conspiracy in which they are both embroiled. Perhaps just as significant is the fact that he is not limited by the morality that so often constrains the Doctor. Aboard the TARDIS, they endure a tense, tenuous relationship. Though they know each other better than any other, and their personal timelines have been hopelessly entangled, betrayal is a certainty. This entry was posted on 29/12/2015 by hedgewick. 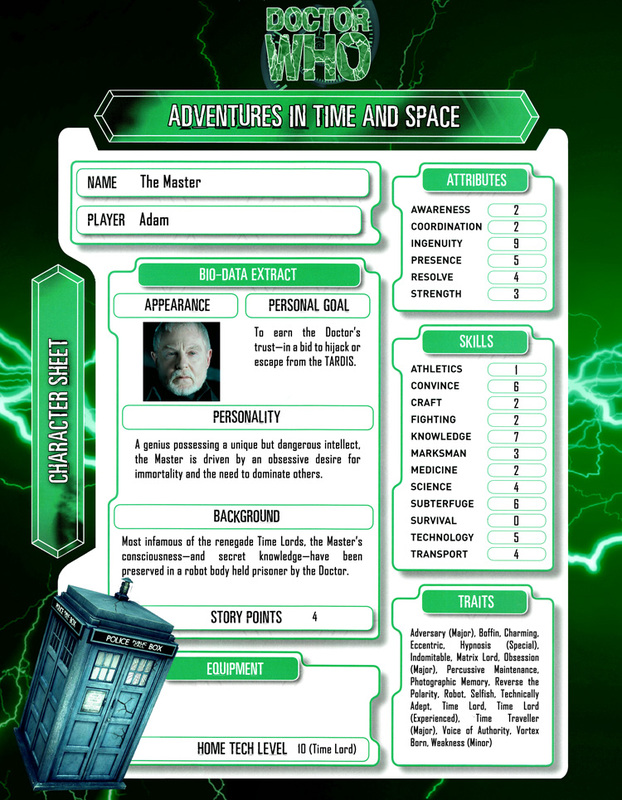 It was filed under The Nth Doctor and was tagged with Character Sheets, The Master. Hi Folks. I’m curious to know why you’re using Sir Derek Jaconi’s face as the Master android and not Roger Delgado, who I thought the ‘Scream of the Shalka’ looked like. Derek Jacobi provided the voice for the robot Master in “Scream of the Shalka,” the basis for our campaign. He was equally brilliant in the new series of Doctor Who, though it’s a shame that he was in the role for so brief a moment! Thus, though the magnificent Roger Delgado may have inspired the look of this Master, for us it had to be Jacobi. We’ve chosen to use his distinctive visage in all of the campaign’s artwork, as you see here.